A flavored liquid made from the juices remaining after cooking meat, fish, seafood, vegetables, or similar ingredients in water. Unlike a food stock that is made from meat, vegetables, bones containing gelatin, herbs, and wine, a Broth only uses meats, meat bones or vegetables. Meat Broths typically started with bones that add gelatin to the finished broth, while the meat and fat add substance, aroma, and flavor. To produce a Broth the liquid that remains after the ingredients have cooked is defatted, strained to remove bones and particles, and often enhanced with herbs and spices to improve the flavor. Vegetable Broths, which contain little or no fat, can at times be substituted for meat Broths. However, the stock may lack flavor and aroma provided by the fats in the meat. If a vegetable stock is desired, it may be best to roast the vegetables with the skins on in order allow the surgars in the vegetables to be released into the Broth, enhancing the flavor, the aroma and the appearance. Broth can be used as a base for many types of soups and stews or as a substitute for water in rice dishes in order to add flavoring. 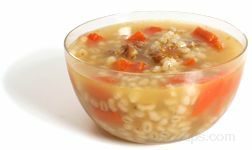 It is not as substantial in content as a true soup, but it is more substantial than a stock, therefore it can be consumed as is, similar to a soup. Other forms of Broth include bouillon or consommé. Bouillon is typically dehydrated into dry cubes or granules, which concentrates the flavor of the broth. A small quantity of the bouillon can then be added to liquid, which may include other ingredients, in order to produce the Broth. A consommé is a liquid Broth that has been clarified to remove the vegetable fibers and fat. Today there are a variety of Broths that are commercially produced, readily available and easily prepared that will simplify the process of making a Broth. Typically, a Broth is produced in one of three versions: 1) a common condensed version, 2) a low-sodium version and; 3) a natural or fully organic version. Within these categories, the Broth may also be labeled as a single or a double strength Broth. Single strength will be lighter colored and lighter flavored, while the double strength will be darker in color and more intense in flavor. When storing Broth, use airtight containers of glass or plastic, but not metal, and place Broth in refrigerator for up to 10 days or in the freezer for several months. A convenient method of freezing Broth is to pour commonly used amounts, such as 1 cup, into airtight freezer bags, to be frozen for later use. Smaller quantities of Broth, such as 1 ounce, can be poured into ice cube trays and frozen. The frozen cubes of Broth can then be removed from the tray and stored in airtight freezer bags. Since commercially produced Broth may be salted, it is best to taste it first before flavoring any Broth with additional salt.